KeyControl 25 XT, 25-Key MIDI Keyboard from ESI. ESI released a new compact, aluminium cased keyboard, shipped together with the full version of Cubase LE 5 from Steinberg and Toontrack's EZdrummer Lite. The MIDI controller can be used after it has been connected to a sound device or to a computer and 4 endless encoders, pitch bend wheel and modulation fader allow you to control your software synthesizers directly from the keyboard. 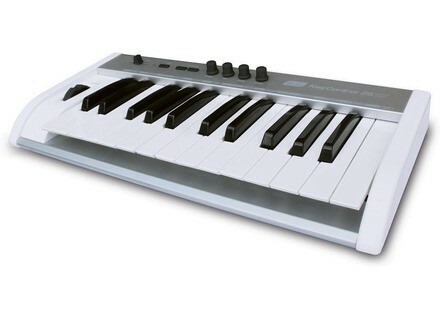 It features a 25-note, velocity-sensitive keyboard aluminium case with glossy white side panels, Pitch bend wheel, Modulation fader, Edit buttons for advanced programming, Sustain foot pedal input, Octave buttons, programmable Powered via USB (no power adapter required). Audio Impressions 70 DVZ Strings Audio Impressions, Inc. has officially released their 70 DVZ Strings orchestral sample library. Celemony Melodyne Editor v1.2 Celemony announced version 1.2 of Melodyne editor, Melodyne assistant and Melodyne essential. The update brings 64-bit compatibility and various optimizations.